There’s just nothing better than a BIG slice of carrot cake! 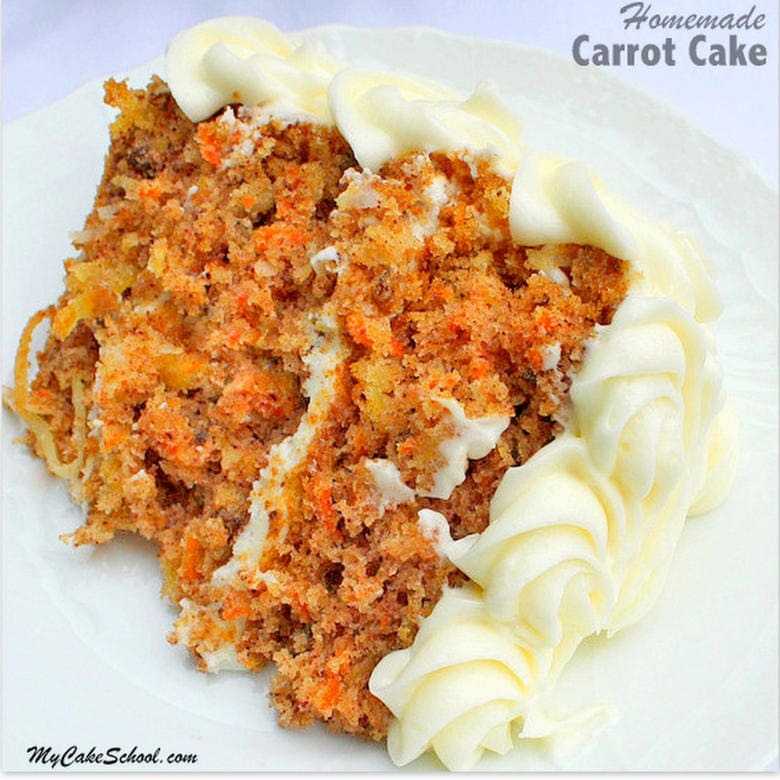 We LOVE this moist scratch Carrot Cake recipe for it’s winning combination of flavors. This recipe has it all: carrots, spices, pecans, coconut & pineapple! With that amazing roundup of ingredients, how could you go wrong? Carrot Cake is a year-round favorite. 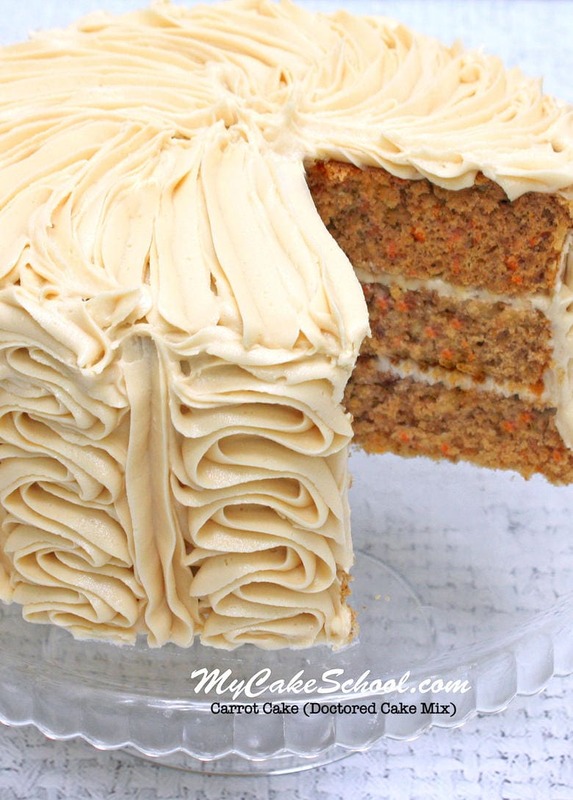 A thick coat of cream cheese frosting with moist and flavorful carrot cake layers is a heavenly combination. 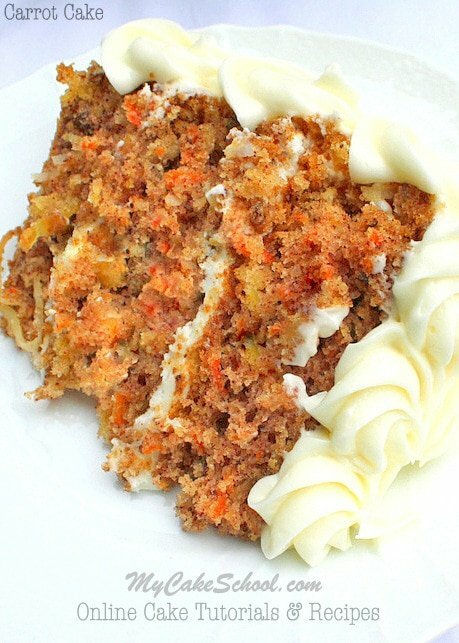 I’ve experimented with and tried so many carrot cake recipes over the years, but this recipe is our absolute favorite! This has been one of our most popular cake recipes over the years. We hope that you enjoy it! *I think that carrot cakes are best with cream cheese frosting! You can find our cream cheese buttercream frosting listed in our recipe below, or you may also like our Pipeable Cream Cheese Frosting if you prefer a thicker consistency! Either recipe tastes fantastic with carrot cake! I love this close-up shot. Look at all of that goodness! This scratch Carrot Cake is my FAVORITE cake, and one of our most popular recipes on the site! Carrot cake with crushed pineapple, pecans, coconut, and spices! 1 (8oz.) can crushed pineapple, put in a strainer and let the liquid drain off….I press with a fork to remove more liquid. 2 (8oz) packages cream cheese (total weight 452g) I use full fat cream cheese. Using reduced fat or the spreadable cream cheese will cause the frosting to be too soft. Soften very slightly. Line the bottoms of 3 (8 inch) or 2 (9 inch) round pans with wax or parchment paper, grease with shortening and flour the paper and pans for easy release when turning out……carrot cake has a tendency to stick so be sure to use the paper. In the bowl of your mixer, add 2 cups sugar , 4 eggs, 1 cup oil and 1 tsp. vanilla. Mix 2 to 3 minutes at medium speed until well blended and light colored. Cut the butter into slices and add to the bowl of your mixer. Beat on low to medium speed until the butter is softened and smooth. Cut the cold cream cheese into pieces and add to the butter, beating at low to medium speed until incorporated. If you are using a hand mixer you may need to soften the cream cheese a bit more. Add the vanilla. Gradually add the powdered sugar beating on low speed until blended. Cover the bowl with a towel to keep down the cloud of powdered sugar. Increase mixing speed and beat until fluffy. Don't over beat or it will become too soft. If it becomes too soft, just refrigerate a short while to firm it up a bit. This frosting will pipe best if used while still chilled. You can make it in advance, refrigerate and when ready to use let it soften slightly (do not microwave) and remix. Don’t miss our full listing of favorite Cake Recipes in our Cake Recipes section! Thanks for stopping by! Hi Marilyn, You can bake this in a 9×13 pan, it will somewhat thin as there is only 6 1/2 cups batter. Bake at 350 degrees for 35 to 40 minutes. Here are links to batter amounts and pan sizes that will be helpful to you. I made the Carrot Cake using the pipeable cream cheese receipe. It was great, just like the ones I remember eating back in the day. It is hard to find original receipes , everyone has their own way of baking. But this is the best way to make carrot cake. Some things do not need to be changed! Hi Jaye, Thank you for posting your review, we are so happy you enjoyed the recipe!! Your recipe sounds amazing! I would love to try baking it. I’m a little gun shy to try any recipe for I live at an elevation of 4700. Do you have any suggestions or conversions to you recipe for high elevations? Hi Linda, We live close to sea level so we do not have first hand experience with high altitude baking. Here is a link to a Craftsy post that I think you will find helpful. Would this recipe work well as cupcakes? Are all your recipes work well for cupcakes? Hi Novi, I have not made cupcakes with this recipe but comment #8 made them successfully. If a recipe can be made into cupcakes I post it at the end of the recipe instruction along with the amount of batter the recipe makes. Most recipes can be used for cupcakes. Hello! I am looking for a carrot cake recipe that can be covered in fondant. Do you think I can use this recipe or the doctored cake mix recipe? On Aug,24th 2018 I made this carrot cake , the scratch version. It was fantastic! It was for a 2 tier baby shower cake . I am very pleased to have this recipe. It is Delicious ! Hi Kulsum, We have not used fresh pineapple in this recipe so I cannot be certain, but I think it would be fine to do so. I would cut the pineapple into small pieces. How long do you bake cupcakes using the carrot cake from scratch recipe? Hi Nada, Bake cupcakes at 350 degrees for 18 to 20 minutes. Check with a toothpick, when it comes out clean or with just a few crumbs attached they are done. Hi!!! This is the best carrot cake EVER! I have made it so many times and it always comes out perfect. Thank you so much for all your wonderful recipes and for sharing them us all of us. I send you a warm hug from Punta Cana, Dominican Republic. I’m making this scratch recipe for Easter as a gift so I’m all about the results. My question is why doesn’t this recipe use nutmeg, ginger and/or cloves like a few other carrot cake recipes I’ve seen? Thanks so much. Love your website! Hi Sharon, It is just our personal preference to have cinnamon as the only spice in our recipe. I hope you enjoy the recipe, if you give it a try. Hi everyone!! This is the best carrot cake ever, no questions about it. Hi Deloris, Thank you so much for your nice comment on the recipe! !